UAE master developer Nakheel today (October 22) broke ground on its Dh713 million ($194 million) twin-building project located within the Dragon City mixed-use community in Dubai. 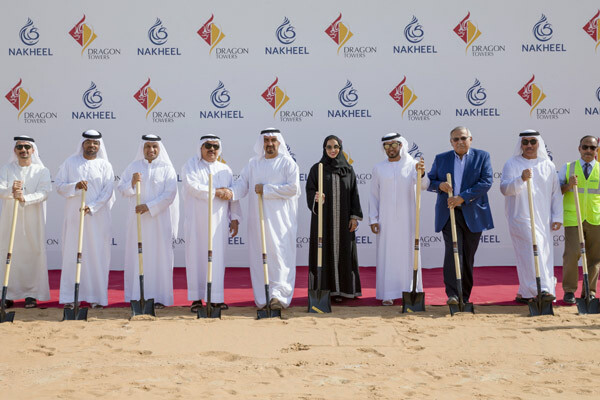 The ground-breaking ceremony, led by Nakheel chairman Ali Rashid Lootah, comes a month after the developer had awarded a Dh552-million contract to the UAE-based Ali Mousa & Sons Contracting for building the project – the first residential component at Dragon City and the only high-rise in the area. It is due for completion in 2021. Dragon Towers, which went on sale last month with prices starting from Dh449,000, is connected by a covered bridge to the world-famous Dragon Mart and its 5,000 shops, restaurants and attractions, said a statement from Nakheel. The project comprises two 37-storey buildings each with 571 stylish one- and two-bedroom apartments. There are also two floors of retail space, four parking levels and a sixth-floor podium level clubhouse with a 25-m swimming pool, children’s pool, restaurant, gym and tennis court, it stated. Located on the Al Awir Road, the apartments are easily accessible via a new interchange, with excellent connectivity to Sheikh Mohammed bin Zayed Road and just a few minutes’ drive from Dubai International Airport. The upcoming Dubai Metro Green Line extension and new metro stations nearby will provide convenient access to the rest of the city, said the Dubai developer.